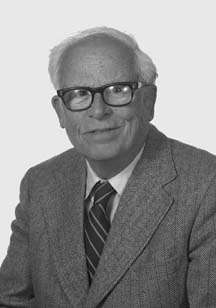 Kenneth Sanborn Pitzer (January 6, 1914 – December 26, 1997) was an American physical and theoretical chemist, educator, and university president. He was described as "one of the most inﬂuential physical chemists of his era" whose work "spanned almost all of the important ﬁelds of physical chemistry: thermodynamics, statistical mechanics, molecular structure, quantum mechanics, spectroscopy, chemical bonding, relativistic chemical effects, properties of concentrated aqueous salt solutions, kinetics, and conformational analysis." His father, Russell K. Pitzer, founded Pitzer College, one of the seven Claremont Colleges in California. His son, Russell M. Pitzer is also a notable chemist who is currently retired from the faculty at The Ohio State University. Rossini, Frederick D.; Pitzer, Kenneth S.; Arnett, Raymond L.; Braun, Rita M.; Pimentel, George C. (1953). Selected Values of Physical and Thermodynamic Properties of Hydrocarbons and Related Compounds: Comprising the Tables of the American Petroleum Institure Research Project 44 Extant as of December 31, 1952. Pittsburgh: Carnegie Press. 1 2 3 E. Connick, Robert E. Connick (December 2000). "Kenneth Pitzer, 6 January 1914 · 26 December 1997". Proceedings of the American Philosophical Society. 14 (4): 479–483. JSTOR 1515624. ↑ Curl, Robert F.; Gwinn, William D. (1990). "Biography of Kenneth S. Pitzer". J. Phys. Chem. 94 (20): 7743–7753. doi:10.1021/j100383a001. ↑ Pitzer, Kenneth S., ed. (1993). Molecular Structure and Statistical Thermodynamics: Selected Papers of Kenneth S. Pitzer. World Scientific Series in 20th Century Chemistry. 1. Singapore: World Scientific. ISBN 981-02-1439-1. ↑ Rard, Joseph A. (1999). "Memorial Tribute Kenneth Sanborn Pitzer 1914-1997". Journal of Solution Chemistry. 28 (4): 247–264. doi:10.1023/A:1022619709105. ↑ In the Matter of J. Robert Oppenheimer: Transcript of Hearing Before Personnel Security Board. Washington, D.C.: United States Government Printing Office. 1954. pp. 697–709.